Haryanvi hot dancer Sapna Choudhary brings a new song video with Punjabi singer Daler Mehendi. Check out the poster here. Haryanvi hot dancer and singer Sapna Choudhary is making headlines for her upcoming project. Whenever she dances on stage shows or shares videos, her fans go crazy as they only wait to see hot thumkas of Sapna. The bombshell and Daler Mehendi have done many stage shows together. They bring out the best of music as it’s the mix of Haryanvi and Punjabi. 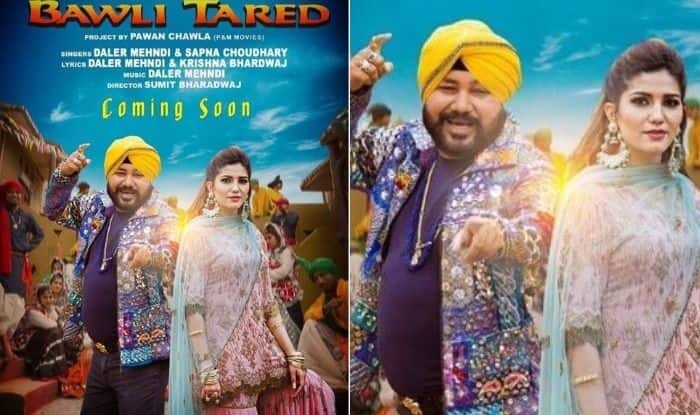 In the song, Daler Mehendi has also styled Sapna Choudhary during the shoot video. This will be Sapna’s debut in singing. Sapna Choudhary has done many stage shows and got fame after coming out of the Bigg Boss house. A few of her popular songs are Tu Cheej Lajwaab, English Medium, Yaar Tera Chetak Pe Chale, Teri Lat Lag Ja Gi, Ghungaat, Theke Aali, Tere Thumke and Teri Aankhya Ka Yo Kajal. She also featured in Bollywood songs like Tere Thumke Sapna Choudhary from Nanu Ki Jaanu and Hatt Ja Tau in Pulkit Samrat starrer Veerey Ki Wedding. On the other hand, Daler Mehendi revolutionized the scenario of the entire music industry in India. His ever famous tracks are Tunak Tunak Tun and Na Na Na Re. From the latest collection, he has given his voice in Jiyo Re Baahubali and Dangal’s Title Track.